Strict canonical base pairing, however, does not provide a general rule for the interaction between the first anticodon residue and the third residue of the codon. It has been noted that if an amino acid is coded by two, three, or four codons, the first two nucleotide residues of these codons are always identical; only the third position is different (Figs. 2.1 and 2.2). Thus, a given amino acid is strictly coded by the two first codon positions but less strictly by the third position. On the other hand, it has been found that ribosomes programmed by different codons for the same amino acid may bind the same tRNA species; in other words, a tRNA can recognize more than one codon. For example, the same tRNAPhe recognizes both UUU and UUC. Upon analyzing this and other facts, Crick (1966) proposed his hypothesis about the pairing of the first nucleotide of the anticodon with the third residue of the codon; he suggested the possibility of base wobbling in this position. This proposal implies that, in addition to standard A:U, U:A, G:C, and C:G pairing, as well as I:C pairing (I, a deaminated A derivative, pairs similarly with G), noncanonical pairs may form whose geometric parameters are close to the standard ones. Such pairs include A:G; G:A and I:A; G:U and I:U; U:G; U:U; and U:C and C:U (Fig. 10.1). Figure 10.1. Relative positions and directions of N-glycosidic bonds of nucleoside residues in pairing the first base of the anticodon (left) with the third base of the codon (right) (F.H.C. Crick, J. Mol. Biol. 19, 548-555, 1966). The heavy circles indicate the positions of C1'-atoms of the residues; the thick line sections designate N-glycosidic bonds. The standard A:U pair drawn in thinner circles (shaded) and lines is shown for reference. If the C1'-atom of the anticodon residue is fixed in position X, the C1'-atom of the codon residue is found either in the standard position (in the cases of the standard pairs) or in positions deviated from the standard (in the cases of the wobble pairs). The following characteristics of the codon dictionary (Fig. 2.2) should, however, be taken into account in order to fit the proposal to the facts: (1) U and C located in the third position of the codon are always equivalent according to the coding specificity; (2) A and G in the third codon position are often (but not always) equivalent; (3) pyrimidine nucleotides (U or C) and purine nucleotides (A or G) in the third position of the codon sometimes are not equivalent (i.e., can be distinguished). By the time these rules were formulated, it was already known that I is often found in tRNA anticodons, while A in the first anticodon position is not detected and appears always to be converted into I by enzymatic deamination. The types of wobble base pairing proposed by Crick, compared to standard pairing, are given in Fig. 10.2. Furthermore, according to the wobble hypothesis, I cannot be present in a tRNA anticodon when the corresponding amino acid is coded by two codons only. Hence, the hypothesis predicts that I could never be present in the first position of the anticodons in phenylalanine, tyrosine, cysteine, histidine, glutamic acid, glutamine, aspartic acid, and asparagine tRNAs. Finally, when a given amino acid is coded by four codons, no fewer than two tRNAs with different anticodons should be present. One of these tRNA species may recognize U and C, while the other recognizes A and G in the third codon position (if G and U are in the first position of their anticodons, respectively); later it was shown that this situation is typical of Prokaryotes (except tRNAArg with ICG as anticodon). Alternatively, one tRNA recognizes U, C, and A, while the other recognizes only G in the third codon position (if I and C are in the first position of their anticodons); this proved to be more characteristic for codon-anticodon recognition in Eukaryotes (except tRNAGly). Wobbling at the first position of the anticodon and the third position of the codon, as well as most of the rules and predictions offered by this hypothesis, has been confirmed by subsequent experimental information. Some inconsistencies have been found, however, and so certain rules need to be amended. Most of them are connected with modifications of the wobble position of anticodon (base 34 of tRNA, Fig. 3.8). First of all, in most bacteria and in the eukaryotic cytoplasm U in the first anticodon position (U34) of tRNAs has been found to be always modified (for review, see Yokoyama & Nishimura, 1995). The modification is typically either a derivative of 5-methyl-2-thiouridine in Prokaryotes, or a derivative of 5-hydroxyuridine in Eukaryotes, or 5-methyluridine derivatives in both. Methylation of 2-hydroxyl group of the ribose of the wobble uridine also often occurs. It is the modifications that restrict the recognition in the wobble position in such a way that U pairs with only purines (A and G) rather than with all four nucleotides. U is not modified in a number of tRNAs of mitochondria, chloroplasts and some primitive bacteria like Mycoplasma, and in these cases it recognizes all four bases (A, G, U and C) in the third position of codon. Correspondingly, only one tRNA species, with anticodon UNN, serves in mitochondria, chloroplasts and Mycoplasma to recognize all four codons of a codon family. For example, tRNAVal with a UAC anticodon recognizes GUU, GUC, CUA, and GUG; tRNAAla with UGC as an anticodon recognizes GCU, GCC, GCA, and GCG. In cases where the nucleotide in the first position of the anticodon is capable of recognizing only purine nucleotides in codons, U in the mitochondrial tRNA species is also modified. In bacteria the isoleucine codons are read by two tRNA species, one with anticodon GAU being capable of recognizing codons AUC and AUU (according to the classical wobble rules), whereas the other interacting specifically with codon AUA. Thus, contrary to the original deduction from the wobble rules, there is a situation when a codon ending with A is read alone by a separate tRNA. In this case the wobble position of anticodon contains a special modification of C where lysine residue replaces oxygen at position 2 of pyrimidine ring, the so-called lysidine, that is 4-amino-2-(N6-lysino)-1-(b-D-ribofuranosyl) pyrimidinium. Figure 10.2. Base pairing between the first base of the anticodon and the third base of the codon: ball-and-stick drawings. Left column, top to bottom, G:C, G:U, I:C, and I:U. Right column, top to bottom, I:A, U:A, U:G, and C:G. Solid circles are carbons, shaded circles - nitrogens, large open circles - oxygens, and small open circles - hydrogens; filled sticks are N-glycosidic bonds between the base and ribose. and A) at the third position of codons, rather than just U, as was originally postulated. Figure 10.3. 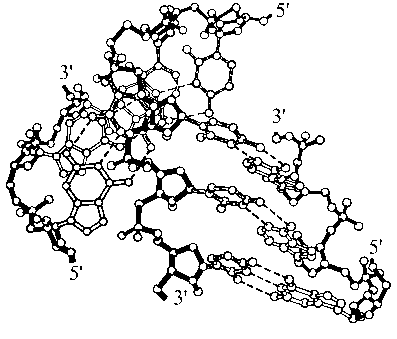 Possible double-helical structures formed by the two codon-anticodon complexes in the ribosome: ball-and-stick drawing (without hydrogens). The mRNA chain (six nucleatide residues) is seen in the middle; the acceptor tRNA anticodon is on the right and the donor tRNA anticodon is on the left. There exists a kink between two mRNA codons such that if the backbone of the 3'-side codon of the mRNA lies approximately on the plane of the figure, the chain direction of the 5'-codon is almost perpendicular to this plane. The broken lines designate hydrogen bonding between the codon and anticodon bases. (A.S. Spirin & V.I. 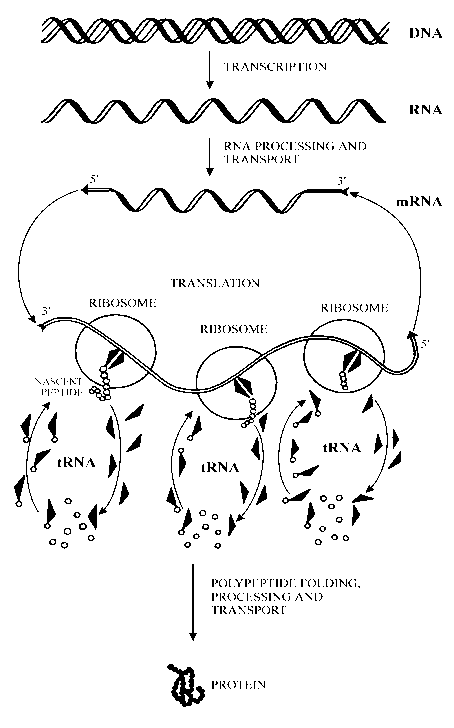 Lim, in "Structure, Function, and Genetics of Ribosomes", B. Hardesty & G. Kramer, eds., Springer-Verlag, New York, p.p. 556-572, 1986). The structure of the anticodon loop described in Section 3.2.2 features the helical arrangement of the chain section including the three anticodon nucleotides and two residues following them toward the 3'-end. The helix parameters are similar to those of a single chain within the standard RNA double helix. Its bases are stacked. 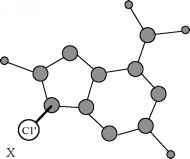 The three bases forming the anticodon are oriented such that the groups responsible for pairing through the hydrogen bond formation are exposed (see Fig. 3.6). The anticodon is thus ready to form a double-helical complex with the complementary sequence without its structure being significantly rearranged. If the L-shaped tRNA molecule is viewed from the outer side of the corner, anticodon up, the groups of the three anticodon bases capable of pairing are turned more or less to the right from the plane containing both limbs of the molecule (see Fig. 3.8). The first anticodon base (wobble position) is located at the very top of the anticodon arm, and the two other anticodon bases and the two subsequent bases of the loop descend from the first base helically, like a spiral staircase, from the left, downward and to the right. When the tRNA anticodon forms a complex with the mRNA, the resulting segment of the double-stranded helix possesses standard (Watson-Crick) pairing downward from the top of the anticodon arm, and less strict (wobble) pairing at the top. The latter is in agreement with the greater steric freedom of the pair, located at the edge of the base stack, compared to the internal pairs of the helix. (In anticodon-codon pairing the third pair may also be considered to be internal since its conformational freedom is restricted by the adjacent stacked purine base of the anticodon loop, and probably also by the adjacent anticodon of the peptidyl-tRNA.) The mRNA codon interacting with the tRNA anticodon in the A site should also acquire helical conformation. The binding of aminoacyl-tRNA to the ribosomal A site during elongation assumes that the P site is occupied by the peptidyl-tRNA. It is likely that the codon-anticodon interaction between the mRNA and the tRNA persists when the tRNA is in the P site. This implies that the triplet next to the codon located at the A site (toward the 5'-end of the mRNA) is also involved in base pairing and has a helical conformation. Figure 10.4. A comparative view of EF-Tu in the GDP and GTP forms (H. Berchtold, L. Reshetnikova, C. O. A. Reiser, N. K. Schirmer, M. Sprinzl & R. Hilgenfeld., Nature 365, 126-132, 1993; M. Kjeldgaard, P. Nissen, S. Thirup & J. Nyborg, Structure 1, 35-50, 1993; G. Polekhina, S. Thirup, M. Kjeldgaard, P. Nissen, C. Lippmann & J. Nyborg, Structure 4, 1141-1151, 1996; K. Abel, M. D. Yoder, R. Hilgenfeld & F. Jurnak, Structure 4, 1153-1159, 1996). A: EF-Tu:GDP complex of E. coli. B: EF-Tu:GTP complex of T. thermophilus. (Reproduced from K. Abel, M. D. Yoder, R. Hilgenfeld & F. Jurnak, Structure 4, 1153-1159, 1996, with permission). aminoacyl ends to be brought into close proximity, thus providing for subsequent transpeptidation (see Fig. 9.10). 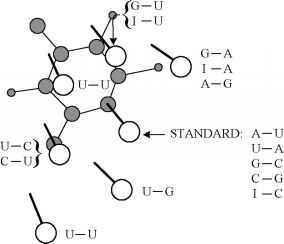 This implies strict requirements regarding the arrangement of the two codon-anticodon duplexes relative to each other. On the basis of steric considerations, it may be assumed that a flexible hinge exists between the two codon-anticodon duplexes in order that the two tRNA molecules are aligned so as to bring their acceptor ends together. Such a flexible hinge may be realized by rotations around the bonds of the internucleotide C(3')-0-P-0-C(5')-C(4') bridge connecting the two mRNA codons, which result in a kink being formed; in other words, the two codon-anticodon duplexes may be not coaxial and, therefore, will not be stacked with each other. One of the possible conformations of the two codon-anticodon duplexes with a kink between them is presented in Fig. 10.3. In Prokaryotes the codon-dependent binding of the aminoacyl-tRNA to the ribosomal A site is catalyzed by the protein referred to as elongation factor Tu (EF-Tu); in Eukaryotes the corresponding factor was called EF-1. It has been proposed to use a universal designation EF1A for both prokaryotic and eukaryotic factors, just adding the prefix "e" (eEF1A) in the case of Eukaryotes. 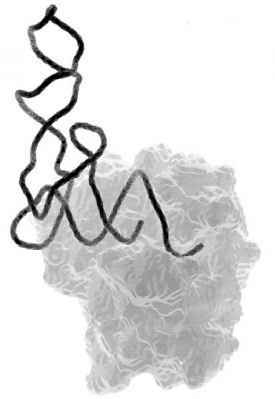 The protein binds GTP and aminoacyl-tRNA and comes to the ribosome as a ternary complex EF1A:GTP:Aa-tRNA. Bacterial EF1A (EF-Tu) is a protein with a molecular mass of about 45,000 daltons (393 and 405 amino acid residues in the cases of E. coli and Thermus thermophilus or T. aquaticus, respectively). It consists of three structural domains (Fig. 10.4). All six p-strands are arranged into a twisted sheet (with five parallel and one antiparallel strands), whereas three a-helices are on one side of the sheet (facing domain 3) and three on the other (facing outside). GTP have a binding site in the region of loops connecting strands and helices on the outside surface of domain 1. The "effector loop" (residues 40 to 60) is a region with a changeable conformation (p « a); it is located at the edge of the p-sheet and adjacent to the interface between domains 1 and 2. The effector loop with stabilized a-helical conformation is thought to interact with the ribosome. Domains 2 and 3 (about 100 amino acid residues each) consist mainly of antiparallel p-strands forming seven-strand and six-strand barrel structures, respectively (Fig. 10.4). These domains are in a tight contact and can be considered as a single structural unit of EF-Tu. Figure 10.5. Ternary complex EF-Tu:GTP:Aa-tRNA. The structure of the ternary complex consisting of yeast Phe-tRNAPhe, Thermus aquaticus EF-Tu and the GTP analog GMP-PNP was determined by X-ray crystallography at 2.7 Y resolution (P. Nissen, M. Kjeldgaard, S. Thirup, G. Polekhina, L. Reshetnikova, B. F. C. Clark & J. Nyborg, Science 270, 1464-1472, 1995). Here EF-Tu is shown as a surface representation and Phe-tRNA as a ribbon. It is seen that EF-Tu interacts with the Tr/acceptor arm of tRNA from the "left" (Ty loop) side. The anticodon arm of tRNA points away from the protein. (Reproduced from J. Nyborg, P. Nissen, M. Kjeldgaard, S. Thirup, G. Polekhina, B. F. C. Clark & L. Reshetnikova, TIBS 21, 81-82, 1996, with permission). stabilized by additional interactions and acquires partly a-helical conformation (two short a-helices are formed). This is the active state of EF-Tu: the molecule is capable of binding aminoacyl-tRNA and then interact with the ribosome. The conformation of EF-Tu bound with EF-Ts is similar to that in the EF-Tu:GDP complex or in the free EF-Tu, i.e. it represents the loose inactive form of EF-Tu. The elongated molecule of EF-Ts interacts with domain 1 and domain 3 of EF-Tu. The interaction induces local conformational changes in domain 1 of EF-Tu resulting in disruption of GDP-binding site and thus the release of GDP from the complex. EF-Tu:GTP + Aa-tRNA—*-Aa-tRNA:EF-Tu:GTP. The association between the aminoacyl-tRNA and EF-Tu is of a multicenter nature and involves all three domains of EF-Tu. The compact active conformation of EF-Tu does not change seriously upon the binding of aminoacyl-tRNA. The EF-Tu bound to the aminoacyl-tRNA covers primarily the left side of the acceptor stem and the T helix of the L-shaped tRNA molecule when the latter is viewed from the outer side of the corner, anticodon up (Fig. 10.5). Domain 3 is responsible for the binding of T stem of aminoacyl-tRNA. It interacts exclusively with the backbone (ribose and phosphate residues) contacting with ribose or phosphate groups of the nucleotide residues 52 to 54 and 63 to 65. Domain 2 forms the pockets to retain the aminoacyl residue with its free amino group and the ester group, and the 3'-terminal adenosine with the hydrophobic adenine and the free 2'-OH group The single-stranded 3'-terminal sequence A73-C74-C75 of the aminoacyl-tRNA molecule binds in the cleft formed by the interface between domains 1 and 2 (Fig. 10.5). The three bases are stacked and continue the helical arrangement of the acceptor double helix; they are turned away from the protein, so that the sequence interacts just by its phosphates with the effector loop (Lys 52) of domain 1. The junction of the three domains of EF-Tu forms a pocket binding the 5'-end of aminoacyl-tRNA.